I am from Guatemala and am associated with Sacred Heart of Jesus, Allentown. From a very young age I have had some restlessness about knowing what it means to be a priest. There has been a desire that only God knows he has sown in me. As a child and young person, I always had a closeness with Jesus through prayer. So one day, God put a priest in my way as a spiritual guide. I discovered without a doubt that God was really calling me to be a Catholic priest. This is why I decided to enter the seminary to prepare myself to serve Christ and the Church. My father, Humberto Ramirez (may he rest in peace and enjoy the presence of God since he died a year ago), and my mother, Irma Rivera (who is still living in Guatemala) have been the best light to me as an example to follow. They have sown the seed of Christ in my life. Also in all the different areas of life, they have given me the strength to follow Jesus in this journey. My brothers and sisters, Auner Ramirez, Huber Ramirez, Geidy Ramirez, Irma Ramirez and Algeria Ramirez, have been a force and support in my life to walk as a seminarian. There has always been respect and close communication between us, and this has led us to be a very united family. I also have two cousins who are priests and have been very important to me: Father Cruz Agustin, a religious priest, and Father Edy Ramirez, a diocesan priest. Now, as a seminarian, they are a force that is always very supportive of me spiritually. I also have had many friends who have marked my life in Guatemala and the United States who have always offered their support and prayers. The Diocese of Allentown has been a great support for me to become a priest, as I believe God has called me to be able to serve Christ through my brothers and sisters who need God. I want to serve everyone, Americans and Hispanics, in different languages such as English, Spanish and Portuguese. I desire to celebrate with them their customs and traditions in the United States, to be the light of Christ for each of these families. I want to help them to always have Christ as the center of their lives. Life as a seminarian is very intense in prayer, as well as academically. It is making me ready to live with Christ and for Christ, and for my brothers. It is a place where I can really know the reality of what the Church lives and to be able to fall in love with it. It is the best place to discover what God desires for me. It is also about a life of companionship, relating to parishioners and listening to the needs of each of them in my apostolate on weekends. 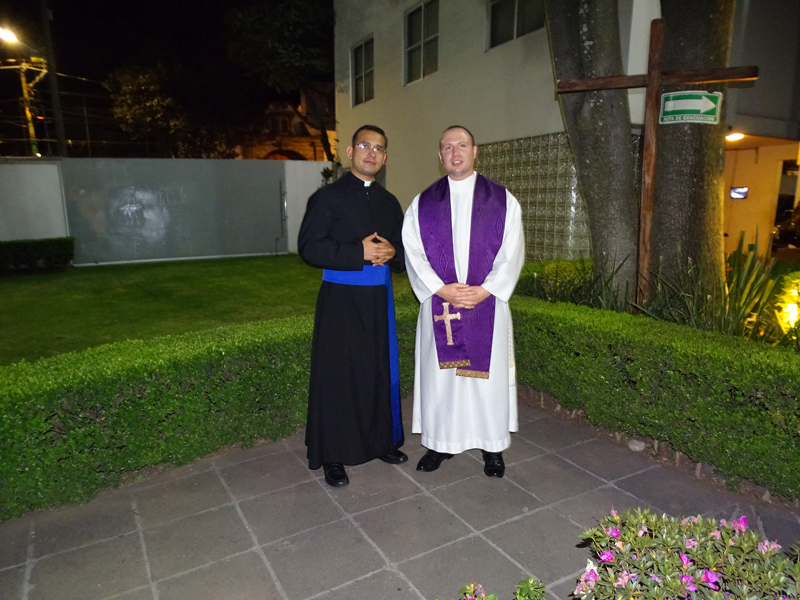 Leiser Ramirez, left, enjoys a visit from Father Christopher Butera, Diocesan director of seminarian formation, while studying at Our Lady of Guadalupe Seminary, Mexico.